I am a bit OCD when it comes to time. I always have clocks around me. I especially like atomic clocks that synchronize with www.time.gov in Boulder, Colorado. Back in 2003, our local Walgreens ran a special on atomic clocks for about $20.00 each. At that time atomic clocks were not as easy to find as they are now (just research them on amazon.com and see how many come up). I ended up buying two of these clocks – Model #701070 Item #C17D1775. About every two years I have to replace the two AA batteries in these clocks. I did not have the owner’s manual handy (it’s more like an owner’s instruction sheet), so I tried to find it on the web. No luck. After looking around in my stuff, I ended up finding one of my two original copies of the instructions tucked away in a box in a cabinet. Thank goodness! So, in an effort to “pay it forward” if anyone needs the instructions for these great clocks…click on this link to download the four page document. 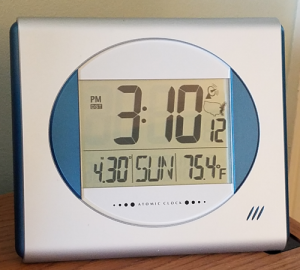 I have since purchased several other atomic clocks…but you always remember your first…right?